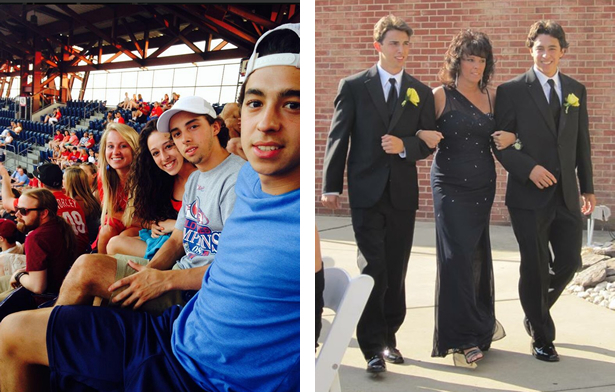 It’s Mothers Day today and I can say that I am truly blessed to have four amazing children. My oldest daughter, Kristen, is married and is the proud mother of a beautiful girl, Kamryn, who just celebrated her first birthday on St. Patrick’s Day. John, who, of course, you all know as Johnny, or Johnny Hockey (but to me he will always be John), is the second oldest followed by Matthew, who is 16 months younger than John. My youngest daughter, Katie, is currently attending high school. The times have changed a lot over the years around the Gaudreau household. The kids are growing up so fast. It seems like yesterday when John walked out of the house as a 16-year-old to go live and play junior hockey in Dubuque, Iowa. At the time, I said to my husband, Guy, "are we crazy? Who let’s their 16-year-old son go play hockey in another time zone?" Well, things have turned out pretty good for John so far, but the hardest thing for us is the fact that he is so far from home. My other son, Matthew, plays hockey at Boston College, just like John did. They even got to play as teammates in John’s junior year at BC. With John and Matty in different locations, our entire family doesn’t get together very often anymore. It gets really hard for me around Thanksgiving and events like that, when our family was always together before the boys left home. Thankfully, we’ve made it work a few times. 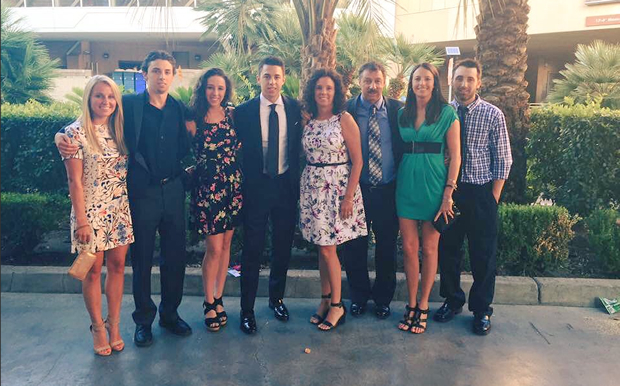 We all got together last June in Las Vegas when John attended the NHL Awards and again, in Nashville, this past January when John played in the All-Star Game (minus Matty, who couldn’t make it because of his hockey schedule). I am really looking forward to a summer gathering we have planned for the entire family this summer! I remember the day when John was drafted by the Flames. He was playing in a AAA hockey summer tournament with all of his friends that my husband runs every year. Someone ran over to the bench and said something to Guy (who was coaching). All the kids started banging their sticks on the ice. I was in the bleachers, at the other end, thinking “what is going on?” Guy yelled over to me to tell me John was drafted. I said "where?" and he yelled out "Calgary." Again, I said "where?" and he repeated "Calgary." I didn’t know much about Calgary other than the Olympics were there and it was very far away. I immediately started to cry. One of the other mothers came over and said, "oh my gosh, you’re crying … you must be so happy!" I said "no, I’m crying because it’s so far away!" I didn’t exactly know where Calgary was but I did know it wasn’t near any of the other Canadian cities where we played youth hockey, like Toronto, Montreal or Ottawa. Immediately, I looked it up on my phone and saw it was 2,363 miles away. I was so upset. A couple of days after the Draft, the biggest bouquet of flowers I have ever seen in my life was delivered to our house. They were from Jay Feaster, who was the Flames’ general manager at the time, and card attached that read, "Jane, welcome to the Flames family. PS: Calgary isn’t that far away." I don’t know how Mr. Feaster knew I was so upset but that gesture meant so much to me. The organization has been so good to John and our family. When my daughter had her baby, they sent us a Flames jersey, socks, shirts and even a pacifier! It didn’t bring us any closer to Calgary geographically, but it sure made us feel welcome and a lot better about John getting drafted by the Flames! We still wish John was closer to home but we are starting to get more comfortable with where he is. Our family is very close and our kids do a lot together. 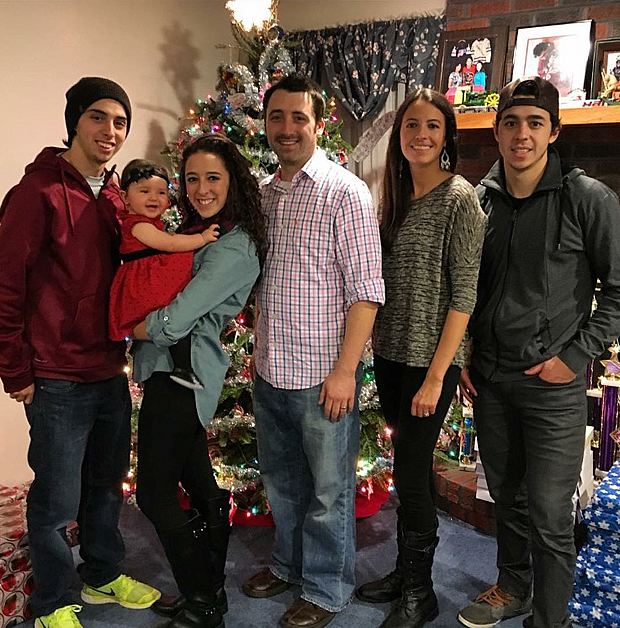 When Kristen was planning her wedding a few years ago, she badly wanted both of her brothers there for the big day so she had to work around their busy hockey schedules, which left her with just a two-week window in August. More recently, when Katie attended her junior prom, neither of her brothers were there to celebrate because of their hockey schedules, which was difficult for her as she would have liked them to be a part of the occasion. Times like that can be a challenge for us as a family. We try to watch both John and Matty play as often as we can. It’s a little easier for us to get out to Matty’s games at BC which is a six-hour drive from home. Watching John play live is a little tougher as Calgary plays most of their games in the West which is a lot further than six hours! With that being said, we do get out to Calgary once or twice a year, and then follow him through cities close to home, like Pittsburgh, Philadelphia, New York and Boston. We try to watch him play live whenever we can. Although John and Matty aren’t at BC together anymore, they continue to be as close now as when they were young boys. They did everything together growing up. They both played hockey all year round, soccer in the summer, basketball in the winter and baseball in the spring. But hockey was always their biggest love. They would always play hockey inside our home with mini-sticks and nets. When their homework was done they would grab those little sticks and play until they went to bed. The little balls they played with would be all over the house. If they ever did anything wrong, we would ground them by taking away their mini-sticks and balls. We didn’t take away the nets because they couldn’t play without sticks and a ball ... or so we thought. I recall a time we had taken their mini-sticks and balls away -- they were probably 3 and 4 years old. I was in the laundry room and when I came out they had taken two spatulas from the kitchen and then rolled up some aluminum foil into a ball and were playing hockey on our hardwood floor! I told them they needed to put the kitchen utensils away because they weren’t allowed to play hockey. John, who did all the talking for Matty back then, said “no mom, you took away our hockey sticks and ball. You said we couldn’t play with those." I had to turn around because I was laughing so hard! Leave it to John to find a loophole in our household rules! It forced us to be a little clearer when we defined the rules moving forward. Next time NO hockey. Period. When I think back to those early days of the boys playing hockey in the house, I could have never imagined where it would lead. Never in my wildest dreams would I have predicted this outcome. Over the years, Guy and I have watched countless hours of hockey. As much as I enjoy the games, being a typical hockey mom, I still worry a lot about John getting hurt when he plays. Watching the games on TV is hard because there are times I think he might have been hurt but the camera doesn’t follow him. He might miss a shift or something and I start to get worried. I won’t even think about going to sleep until I know he is okay, which makes for some pretty late nights with the time difference. He is really good at letting me know he’s not hurt, though. He will send me a text after the game to tell me he’s fine. It’s usually followed up with a "lol." It was a little easier when John played junior and college hockey because he always wore a full cage to protect his face. When he made the NHL I actually told John to ask if he could wear a full cage. He kind of rolled his eyes and said, "Mom, nobody does that." I said “well … maybe if you just asked them?" He said "Mom, I’m not doing that." Then I thought what about a shield that comes down … like really, really far? My husband finally said, "Jane, let it go. They aren’t going to do that." Ironically, both of my boys have scars on their faces, but not from playing hockey. John has a small scar under his eye after took a tumble down the stairs and was met with an end table at my mother’s house when he was just two-years-old. Matty’s scar came from trying to pretend he was Superman on a bench. John asks me every once and a while if I wished he was drafted by the Philadelphia Flyers so he was closer to home. Of course, I would like him to be closer to home, but Calgary has really grown on us. The fans there are incredible and no U.S. city, that I’ve seen, has fans as passionate as the Flames. It’s absolutely incredible! Guy and I traveled to Calgary for the playoffs last season and we were amazed at how many Gaudreau jerseys we saw at the games! It was so surreal. We couldn’t have imaged anything like that in a million years! There were even fans who recognized us and wanted our picture. That is something we definitely aren’t used to! I know John has a lot of fans but I will always be his biggest fan. It has been quite the ride so far for our entire family but it’s also just getting started. I am looking forward to many, many more years of being a proud hockey mom.